The NFL season is already nearly 25% complete through the regular season. But we've only covered the frosting of my cake. The cake that I like to call the NFL. Also, the cake that we here call the NFL Picks. Let's see the good, the bad and the ugly! -Deus Legend was the ONLY person to pick BOTH the San Francisco 49ers and the St. Louis "Crams", and got both of these NFC West teams WRONG, as they lost in style. -Deus Legend made up for his confidence in the NFC West teams by being the only guy to pick Jim Zorn, a former Seattle Seahawk, and his Washington Redskins to take down the "Ballas" Cowboys. -Finch865 was the ONLY member of our picks to pick the Oakland Raiders over the San Diego SuperChargers, and got it WRONG. -Finch865 made up for his previous mistake by going with his gut and being the ONLY person to get the Tampa Bay Buccaneers CORRECT over the Green Bay Packers. He trusted Matt Bryant, and our prayers are with Matt Bryant and his family for their terrible family loss. -EVERYBODY picked the Philadelphia Eagles and the Denver Broncos, and got them BOTH WRONG. So, it's still pretty close. Flynn4DaWin still has the top spot, but JRC 865 is in hot pursuit! Good luck everyone! Thanks for your participation in our NFL Picks, and I hope that you enjoy it so far! If you have any suggestions, comments, complaints, etc. please send me a message on Xbox Live or on here. I have a few ideas in mind for how we should go about the NFL Playoffs in our Picks when we get to that point, but if you have some ideas I'd love to hear them! Thanks! 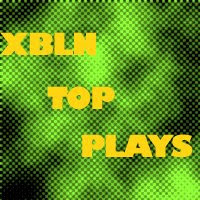 Here is our September Edition of XBLN Top Plays. Enjoy the show and stay tuned for next months edtion as we will have Basketball and possibly FIFA highlights added to the show. 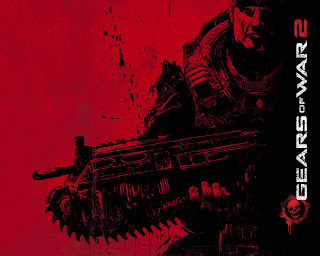 Posted over on the Evil Avatar forums is a supposed list of Gears of War 2 information gathered from the latest issue of GamePro magazine. According to Mr. forum poster and his GamePro mag, Gears 2 will ship with a redemption code that enables players to download five remade maps from the original Gears free of charge. The remade maps - Gridlock, Subway, Canals, Mansion, and Tyro Station - will be available to download off the XBLM day one of release, but ONLY to those who purchase a new copy of the game with the redemption code. This highlight was in a game I had online against somebody online using the Philadelphia Eagles. I dropped back to pass with Matt Hasselbeck, he threw it awkwardly (kind of like that pass Aaron Rodgers did on Monday Night Football in Week 1 for a TD). Deion Branch catches it, stiff arms Asante Samuel in the face, and dives in for the TD. This was in the same game and caused my opponent to quit. Marcus Trufant's pick six put me up 38-0, and basically ended the game. It was probably the most dominant game I've ever played against an online opponent in Madden 09. Our first ever XBLNCS Dynasty is finally over. Our Rose Bowl winner was JRC865. He will recieve our third place prize which was a 48 hour trial. Our XBLNCS National Champion is Deus Legend. He will recieve the first place prize two months Xbox Live and Flynn4dawin will recieve 100 Microsoft Points. There will be no highlights however from the XBLNCS National Championship Game due to technical reason so the game could not be played between Deus Legend and Flynn4dawin. It was fun doing this Online Dynasty. We will now shift our focus on the Madden League now. We will restart the Madden League now that the patch has came out and to allow our players to change teams. 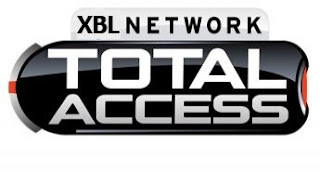 Also stay tuned as we may be opening up a club to play together on with NBA Live 09. 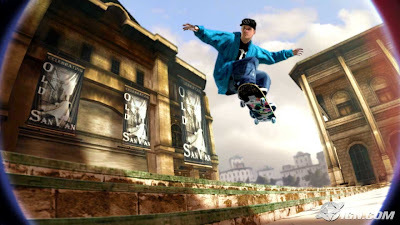 -I, Jerhawk, was the only person to pick the Jacksonville Jaguars over the Indianapolis Colts, and got it correct. -Deus Legend was the only person to pick the St. Louis Rams to beat my Seattle Seahawks. He got that one WRONG. -EVERYBODY PICKED the Buffalo Bills over the Tampa Bay Buccaneers, and got it CORRECT. On the other hand, EVERYBODY PICKED the Chicago Bears AND the New England Patriots, and got them both WRONG. -UnKillableBeast was the ONLY contestant to pick the Kansas City Chiefs as well as the New Orleans Saints, and got them both WRONG. -UnKillableBeast, when picking the Cowboys, called them "ballas." I'm not sure if that was a typo, or done on purpose, but I found that kind of funny, since they've played like "ballas" all season. Just another funny side note, I've gotten 9 picks correct every week so far. I kind of thought that was weird, to get the same amount each week. So, let's see who can take down the all mighty Flynn4DaWin in our Week 4 picks! Here are the games, and remember that due to bye weeks there won't be as many games, which means that our scores will be lower throughout the next several weeks. Good luck everybody, and please get your picks in the comment section by midnight on Saturday! Good luck everyone! 2K Sports today announced details on Living Rosters, an exciting new innovative online feature for this season's highly anticipated basketball title, NBA 2K9. Living Rosters will ensure dedicated fans are playing with the most up-to-date and complete basketball experience ever available in the NBA 2K franchise. In addition to delivering constant updates to player ratings and player tendencies, Living Rosters will also offer exclusive access to unlockable animation packages for players in the game. When a player starts to heat up and takes his game to the next level on the real courts, new animation packages will unlock for that player in the video game. As the NBA season progresses, so will NBA 2K9, as players will have the ability to pull off new moves never seen before in the video game, adapt their offensive and defensive rotations, and shift starting lineups as they occur. 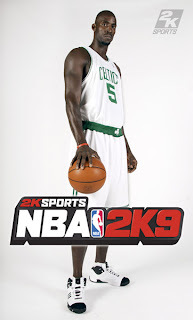 If it happens during the regular NBA season, it will happen in NBA 2K9 thanks to Living Rosters. 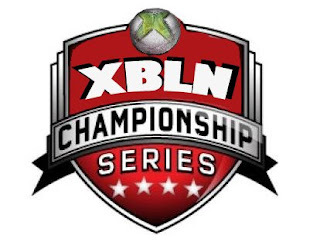 The much anticipated XBLNCS Nation Championship Game will occur this Tuesday. The game will be Georgia vs Oklahoma to fight for the Coaches Trophy. Be sure to come back here Tuesday Night to catch the Top 5 Highlights of the game. The patches for Madden 09 and NFL Head Coach 09 have been in certification testing with Microsoft and Sony for some time now so here is the latest on where we are at with those. Madden 09 may be receiving its second patch as early as tonight. Producer Phil Frazier believes it is more than likely coming late tonight/early tomorrow morning (could be 5am ET). It should be arriving for both the 360 and PS3. The details on what will come with the patch can be found here. The patch for Head Coach is set to be released at 5am ET tomorrow morning for the 360. 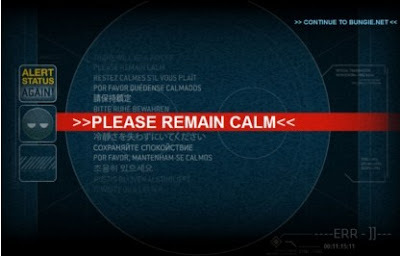 However the PS3 will not be receiving the patch until possibly next week or the following week (there was a problem that required resubmitting). The details on what will come with the patch can be found here. The fourth roster update for Madden 09 is currently set to be out later today. EA is attempting to release an update every week now and that consistency is welcome. This update includes Shawne Merriman going to the IR, all the receiver changes for the Seahawks (except for Nate Burleson to the IR? ), the Broncos receive the benefit of several ratings increases, and Adrian Peterson moves up to a 98. Continue here for the full list of changes. 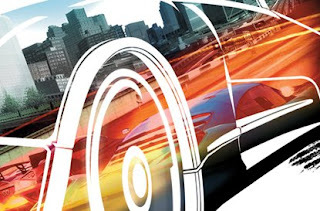 AddictGaming.com is reporting that developer Turn 10 (the crew behind the Forza franchise) is currently working on the next installment of the Project Gotham Racing series seeing that longtime PGR developer Bizarre Creations was bought by Activision. The news comes from an undisclosed Turn 10 employee who says that Microsoft assigned them to PGR5 which will be announced as early as next week. The console race took an unexpected twist in Japan this past week as the Xbox 360 emerged on top of a slowing Wii. Famitsu.com, citing data from parent company Enterbrain, reported today that the 360 sold 28,681 units over the week spanning September 8 to September 14. This was well above the PS3's 8,050 units and even above the Wii's 27,057 units. The 360's sudden success -- the previous week saw sales of just 843 units -- can be attributed to the convergence of a price drop, a new 60 gigabyte model, fresh hardware shipments following weeks of shortages, and the release of Infinite Undiscovery. The tri-Ace-developed RPG is being heavily promoted by Microsoft as the first in a trio of Square Enix games for the system (the other two are Last Remnant and Star Ocean 4). In its first week, Infinite Undiscovery sold 86,708 units, placing it among the highest first week totals for Xbox 360 software in Japan. The 360 has crossed the 717,275 unit mark in Japanese sales, Famitsu.com also revealed. Its predecessor never even managed to cross the 500,000 mark. Activision has confirmed that Infinity Ward will be returning to the Call of Duty franchise, and will be behind the sixth instalment that's due for release in 2009. Call of Duty is currently in the hands of Treyarch, who previously worked on the third game and are taking the first person shooter back to WWII with the forthcoming World at War. There's still no news on where the next game will be set, and though Infinity Ward is thought to be at work on a futuristic science fiction shooter, it's more likely that this is the touted new IP for the company rather than the introduction of ray guns to the series. Mostly great cutscene work that holds up a nice story. The upgrade options are good, but having to load the simple menu is a pain. Some of the technical work is great, but it isn't used as well as it could be. The Xbox 360 version has bits of screen tearing and framerate stuttering. It makes use of the Star Wars sound library, so of course it's fantastic. Using the Force is great fun, but many of the enemies (and bosses) can be tedious to fight. Level design isn't very inspired. The game isn't very long (eight to ten hours if you don't rush) and there's not a ton to go back for. Week 2 is in the books, and things are looking good for some teams, not good for others, especially my Seahawks. But that's ok! Things are also looking good for some of our pick contestants, and not so good for others. But it's still very close. And if you're wondering, I simply deleted the Houston/Baltimore game, so that pick doesn't count for or against you. -Finch865 was the only person to pick BOTH the St. Louis Rams and the Detroit Lions, and got them both wrong. -UnKillableBeast was the only one to pick the Miami Dolphins over the Arizona Cardinals, and got that wrong. -UnKillableBeast was the only person to pick the Washington Redskins over the New Orleans Saints, and got that correct. Not trying to be a jerk, but if these players dont make any picks through Week 5, I'll just remove them out to save some space. Congradulations to Flynn4DaWin in getting first place in both the Week 2 picks and the overall picks. Good job bro. Alright, here's the lineup for Week 3. Please post your picks in the comment section. Thank you all. According to a GAMER.tm and their special "insider source", sometime next week, Microsoft will be holding a huge mystery event where both Bungie and Rare will reveal two super new, super secret projects. Though, the special insider source couldn't confirm what either the Bungie or Rare projects will be. This Thursday, Criterion will be releasing the six hundredth title update for Burnout Paradise titled "Davis" which is better known as the Bike Pack. Among the changes included in the update are the inclusion of two new bikes, 38 additional beat-the-clock races, a day/night adjusting option, dynamic weather effects and 70 new Freeburn challenges. It was announced earlier today that EA is no longer in negotiations to purchase Take Two. This will certainly ease the minds of those into sports games for the time being, however the stock which is currently sitting about $4 less per share than the offer EA had on the table will take another hit tomorrow. Take Two continues to state that there are others interested in buying them up. Whether that happens or something doesn’t eventually materialize there is the potential for more cutbacks for 2K Sports. While the NBA and MLB series are in no danger I do look at NHL as being a possible casualty. Three weeks before the College Hoops franchise was canceled I wrote about how there didn’t seem to be enough overall sales to support multiple titles. That same situation may present itself with NHL down the line. Regardless at least for now everyone can take solice in having some resolution to the seven month long EA-Take Two story. Superb execution, with perfect camera cuts on stage and plenty of your band's personality shining through. It looks almost identical graphically, which is fine, since last year's model was pretty enough to get the job done. A stellar soundtrack that is, without question, the greatest assemblage of songs to date for a videogame. Little has changed in terms of how the game plays, but there have been some very welcome additions. Battle of the Bands is inspired. World Tour, though, needs a revamp. There's still a hefty amount of time to waste on World Tour, but it's the dynamic Player Challenges and Battle of the Bands that will have you hooked for the next year. * “Feel the Pain” - Dinosaur Jr.
* “The One I Love” - R.E.M. * Metallica - "That Was Just Your Life"
* Metallica - "The End of the Line"
* Metallica - "Broken, Beat & Scarred"
* Metallica - "The Day That Never Comes"
* Metallica - "All Nightmare Long"
* Metallica - "The Unforgiven III"
* Metallica - "The Judas Kiss"
* Metallica - "My Apocalypse"
* Metallica - "Suicide & Redemption J.H." * Metallica - "Suicide & Redemption K.H." * Smashing Pumpkins - "1979"
* Smashing Pumpkins - "The Everlasting Gaze"
* Smashing Pumpkins - "G.L.O.W." * R.E.M. - "Horse To Water"
* R.E.M. - "Man-Sized Wreath"
* R.E.M. - "Supernatural Superserious"
Out with the old and in with the new. Our webmasters have whipped up a whole new template for the site. Everything is new from the All New Banner, to the template itself. Welcome to the New Xbox Live Network Experience. There may be so errors every now and then. Don't panic, we are just insuring that you have a quality experience here at Xbox Live Network. Also, please let us know in the comment section or through email if there is something that need to be fixed with the site that we may have missed. And also remember that this site is designed for use with the Firefox Web Browser. There may be some compatibility issues with other browsers so please let use know if you have any issues and also note not only the browser you are using but also the version of your browser. Again to alleviate all potential problems, use Firefox to get the most out of The New XBLN Experience. In my offline Franchise mode, Josh Wilson was able to return this kickoff to the house for a sweet Touchdown. He is truly the Little Engine that could. This is the RockBand 2 intro video, which is pretty cool. The song playing is "Hello There" by Cheap Trick. It's supposed to be conveying the message of the new online band battles. These are samples of the Bonus Songs on the game. The last one look crazy and could give some people a headache. Personally, I liked "Rob The Prez-O-Dent" by That Handsome Devil, but that's just me. This is a sample of the song "Bodhitsativa" by Steely Dan. I diffidently will not be able to pass this song on Expert, but I'm sure some people will. Maybe this is Rock Band's response to "Through the Fire and Flames"??? When you click on your Gamercard in the New Xbox Experience you will see some familiar options; your messages will be accessible, you will be able to edit your profile or update your Avatar, manage your account, switch profiles (if you have multiple profiles) and change the Theme (more on Themes in the coming weeks). From here you will also be able to see every game you’ve played on your Xbox 360. Check out the screen shot up there (click it for different sizes). The team has created a mock account for Major Nelson. The first card shows all of the Achievements you’ve unlocked and lists out your overall Gamerscore and the highest possible Gamerscore you could have based on the games you’ve played. To the right of that every game you’ve played will have its own card that fans out. If you’ve played 3 games (like this account has), you will have 3 cards. 500 games? All 500 will fan out on your screen. You can check out what Achievements you’ve unlocked per game and what you have left to work on. Deus Legend and Rush23 have made arrangements for the users of TheXBLN.com and the users of Madden List to come together for a united Gamer Community Effort. Xbox Live Network provides xbox games with urgent news updates, game previews, user game highlights, and more. Madden List focuses on Football Video Gaming more specifically Madden NFL and NCAA Football Gaming. Be sure to check out our forum space to discuss anything about games and and our articles here in our dedicated forum space. And check out the rest of Madden List! NCAA Basketball 09 is not just a new name; it introduces a new way to play college basketball that mirrors real life. A new, strategic gameplay feature challenges gamers to replicate their school’s style of play, set the tempo and win. Whether your school plays up tempo looking to push the ball in transition, runs a half-court offense that utilizes the clock and limits possessions or features a balanced attack that combines transition offense with set plays, NCAA Basketball 09 rewards the strategic gamer and emphasizes team specific styles of play. NCAA Basketball 09 will feature Division I coaches in-game for the first time. Each coach will provide real time instruction and feedback, helping gamers control the tempo by executing their team’s offense and defense to perfection. 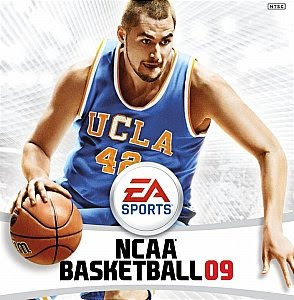 This year on Xbox 360 and PS3, NCAA Basketball 09 will operate on a new gameplay engine with over 1,000 new animation sequences that deliver a more responsive experience with improved ball physics and more intelligent AI. The new animation system enables gamers to apply pressure defense with new full-court presses and traps. Plus, improved AI and animations enable quicker players to get up and down the floor faster and make better decisions running the lanes and driving to the rim. Animations can be interrupted at any time, enabling you to read and respond to the action on the floor, just like real life. 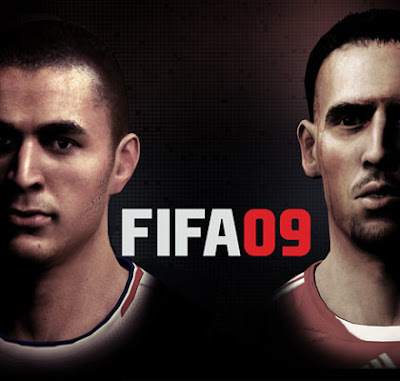 Electronic Arts announced today that a full playable demo of FIFA Soccer 09 will be available for downloada tomorrow. In the demo, play as Chelsea, AC Milan, Schalke 04, Olympique de Marseille, Real Madrid or Toronto FC (MLS) and discover a football experience that matches the complexity, finesse and beauty of the real-world game before it ships to stores world wide in October. In addition to playing an exhibition match, the FIFA Soccer 09 demo enables new gamers to FIFA to practice in the Arena and view tips on basic or advanced gameplay techniques. 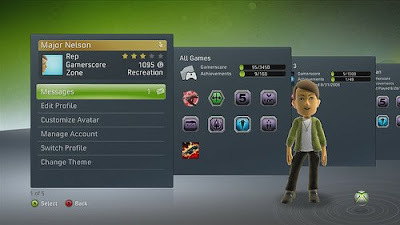 The demo also enable gamers to adjust and customize tactical settings through the feature innovation Custom Team Tactics. Microsoft confirmed rumors that Age of Empires and Halo Wars developer Ensemble Studios will be shut down as soon as work on Halo Wars is completed. In Microsoft's official statement to the media, Ensemble Studios' closure is addressed, mentioning that after completion of Halo Wars, the "leadership team will form a new studio and has agreed to provide ongoing support for Halo Wars as well as work on other projects with Microsoft Game Studios." 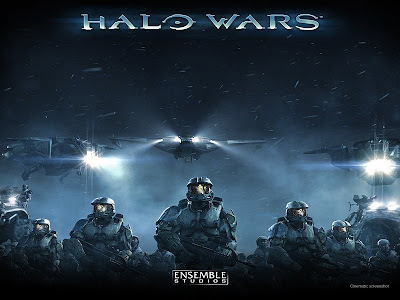 Microsoft also makes it clear that they'll "place as many Ensemble employees who do not move to the newly formed studio into open positions within Microsoft" and insists that the studio's closure has nothing to do with "Ensembles talent or the quality of Halo Wars." According to the 1UP rumor mill, the 60GB HDD bundle was recently revealed to attendees of the GameStop Expo in Las Vegas (employees only, please). The bundle is said to include the 60GB HDD, a 3 month subscription to Xbox Live and an ethernet cable all for $99. Not horribly bad. But what also caught our eye is the other GameStop Expo rumor regarding a new 12 month Xbox Live bundle.The new bundle is pegged to include a year of Xbox Live, a copy of PGR4 and a 360 Messenger Kit for $69. Again, this is all gossipy rumor stuff, so don't get overly excited just yet. LucasArts has announced that an demo of Fracture is scheduled to crack up the Xbox Live Marketplace on Thursday, September 18. 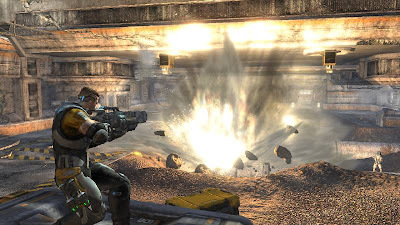 Fracture is a third person shooter with the central mechanic of land deformation, which the devlopers have cleverly dubbed Terrain Deformation. Players can build their own cover or pull the land out from under the feet of approaching enemies. Land deformation can also be used for other things, such as accessing otherwise unreachable areas. Fracture will be hitting retail on October 7 in North America and October 10 in Europe. -Everybody who picked for the games ALL CHOSE Indianapolis and San Diego, and got them both wrong. -Everybody who picked also ALL CHOSE New England, Pittsburgh and Philadelphia and got them all correct. -Only JRC 865 picked San Francisco, and got it wrong. -Only JRC 865 and Deus Legend picked the Atlanta Falcons over the Detroit Lions, and got that correct. Everybody else chose Detroit and got that pick wrong. I found those kind of bizarre, but not unusual I guess. It's only Week 1, so it's hard to seperate the good and bad teams just yet. If you'd like a copy of my Microsoft Excel spreadsheet that I have of our picks, just let me know and I'll e-mail it to you. So, here are the standings from Week 1. After this week, I'll post the Weeks standings as one list, and the overall standings in a seperate list. The letter "T" stands for tied, and the number after their name is the number of picks they got correct. It's pretty close so far, which is expected. We'll get some seperation as the season progresses. Just when winning was out of your reach, you put up a good fight to the finish but you were stopped in the final minutes. You have a foe that you come so close to betting but can't. This version of America's Game is the Lost Battles. 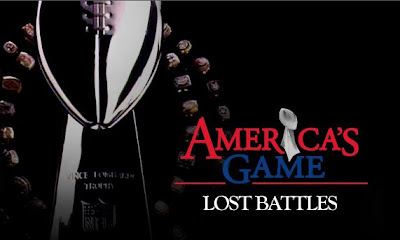 Post your greatest losses in this America's Game! There's an over-the-top (in a good way) intro movie and then some polished menus that feature wrestlers on the side. Oddly, the menus move slow in-game and make you wait to press a button. The wrestlers look great and it's cool to see the ring ropes bounce after a big move. Thankfully, there usually aren't that many clipping issues, but the crowds look bad. As limited as the moves are, the commentary is worse and more repetitive. Moves sound good. The in-ring voices are pulled from one lame pile, but the story VO from Nash and everyone else is solid. 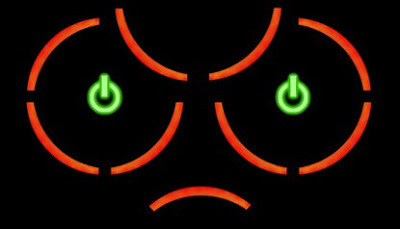 The controls work well and moves look good, but you're going to see the same moves over and over and start to get bored. Tag matches are boring and ugly. The AI is dumb as well as cheap. You can probably get eight hours out of the story. Although I like the controls, the limited move set makes the experience repetitive. There aren't many matches to keep you coming back. Madden producer Phil Frazier has informed me that the second roster update for 09, which did not arrive as scheduled over the weekend, is now out for both the 360 and PS3. Apparently there were several bugs that were caught in testing that had to be ironed out first before going through yet another round of testing. This update will be the same as originally detailed. Because of the big events from week one such as Tom Brady’s injury and subsequent placement on the IR another roster update is being targeted to arrive on Friday. Should the circumstances around the third update change the community will be informed. The 2008 Rose Bowl had an intriguing match-up, the #6 Illinois Fighting Illini versus the #24 Oregon Ducks. The game was a high scoring affair, with the Illini pulling out the victory because of some key defensive turnovers. All in all it was a great game, you can see the highlights above. Unfortunately most of them are from Illinois. Also, this game is set to be release October 23rd. There are so many good games coming out this fall. The question is which one's to buy. Don't worry, we will let you know which games are worth your money. Keep it tuned here at the Xbox Live Network. In 2005, Electronic Arts further shored up its hold on professional sports gaming by signing a 15-year exclusivity contract with the premier sports network, ESPN. One of the most notable outcomes of that deal has been extensive ESPN integration into EA's stalwart gridiron sim Madden NFL, notably by way of a streaming stats ticker highlighting the performance of real-world athletes. 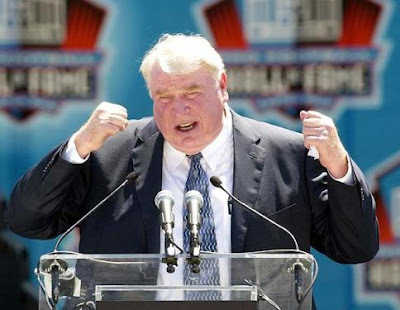 Now, Madden NFL will be playing a more prominent role in ESPN's own broadcasts. The game maker today unveiled the EA Sports Virtual Playbook, which melds ESPN's studio with images from Madden NFL to create what EA calls "augmented reality." 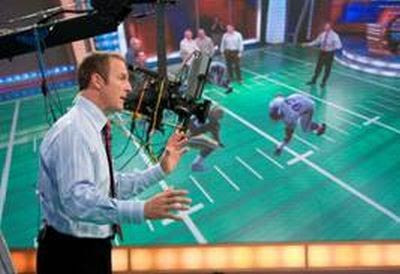 The technology lets real and virtual people move about ESPN's set, highlighting matchups and demonstrating various offensive and defensive hypotheticals. The new technology will be rolled out this week as part of ESPN's Sunday NFL Countdown. The broadcast network also intends to integrate the new technology into its Monday Night Countdown and NFL Live programs, with SportsCenter, ESPNEWS, and ESPN2's morning sports program First Take all potential venues for the Virtual Playbook.